Raj felt defeated when he could not demystify the mystery of his question, and decided to commit suicide. Raj was wondering as to how his all idea appearing in his brain was being captured by others and being implemented? Was there anyone who kept an eye on his thoughts and/or on his idea? Was there any one attempting to hack his brain? If not then how come all his best discoveries developed in his mind and idea of book writing was getting revealed thru others’ in front of this world? It was high time when Raj found a super natural power within. Whenever he used to be with her beloved Suhana or whenever he spoke with Suhana over phone, he could ale to sense the possible mishap planned or any criminal incident about to happen. And this sense used to be so crystal clear that he could indirectly help the police and System to get such criminals nabbed successfully. Raj and Suhana both were wondering “how this power has appeared in him”? After much effort, when Raj could not find the answer as to how his idea were getting stolen and how this unique power to sense unforeseen criminal incidents has come in him, he decided to put his life at end. At the very night of committing suicide, his unique power of sensing the unforeseen disappeared but taught him the lesson to become a successful and famous personality. After learning the lessons Raj implemented them in his life. He not only then became a famous scientist / Inventor but a successful author after writing a unique book. Later the book was opted to be filmed upon. And the success of this movie awarded him with Oscar and in a wink he became a billionaire from a common man. Not only this, but Raj kidnapped Zooppy from farther planet “Napleno”. What were all those lessons, Raj learnt? What were there all mysteries? How did unique power appeared in Raj and then disappeared? All these questions are revealed gradually chapter by chapter at end. 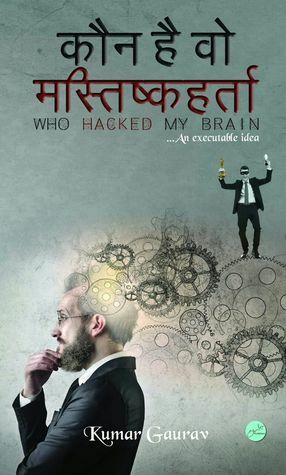 Before you exclaim with wonder, read this page turner “Kaun Hai wo Masthishkaharta” in hindi aka “Who hacked my brain”. KAUN HAI WO MASHTISHKA HARTA is a unique book that cannot be put into any specific genre. The author describes this book as: Self-inspiration. This is the protagonist, Raj’s rags to riches story. But unlike other stories of this genre, this story also has elements of mystery and suspense, that is what makes this book so unique. The characterizations were quite good. Each character had their own role to play in the story. The overall story construction was well thought out. The author was able to keep the readers engaged by ensuring that the suspense is maintained. I also liked the pace at which the story moved on, initially it was a bit slow, but as the story progressed, the pace increased accordingly. I did feel that the story would have been better had the narration been a little better. I felt that at times the narration became a bit dull due to over addition of details that were not needed at that particular point in time. The narration improves as the story progresses. Overall, the story line is unique, it has fresh ideas, good characterization, but can be improved in terms of narration. The all rating I see here is out of 4. I see even tagged book rating as 3*. Again is it out of 4?